"You write some of the best content out there." "Love your blog. . . . And your name." "She is A. MAZE. ING!" 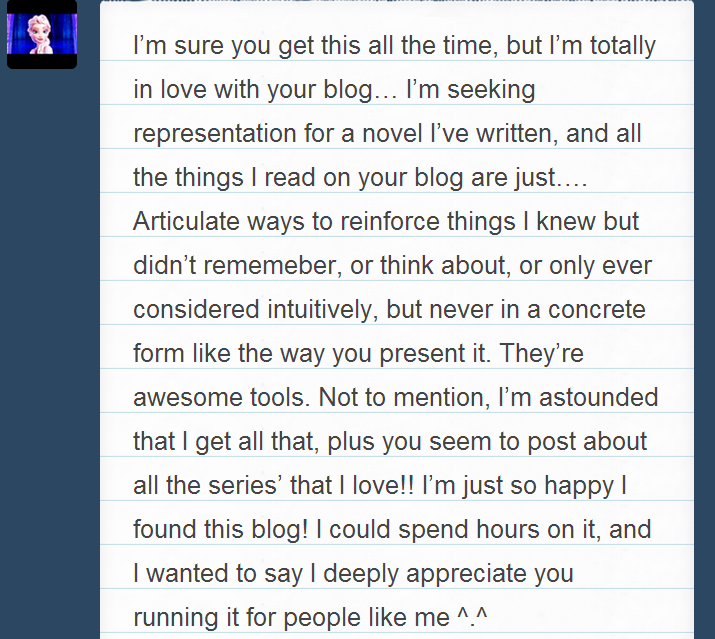 "I just wanted you to know, I love your blog, and what you're doing for writers who read it. It's easy to see you are passionate about writing, but your efforts are nonetheless altruistic in your quest to raise the bar. 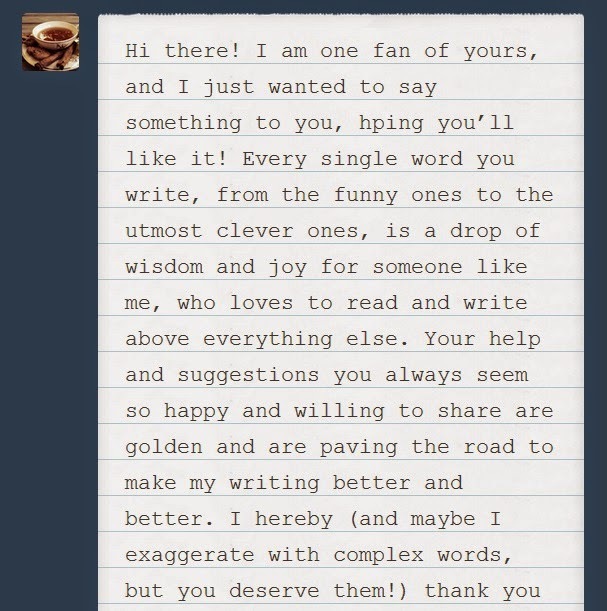 Thanks on behalf of all the people whose writing you have improved that haven't gotten around to thanking you." "I cannot wait to read all of your posts. You pierce my soul with your writing selections and I am learning a lot from you." "This is probably the best advice I've ever received." 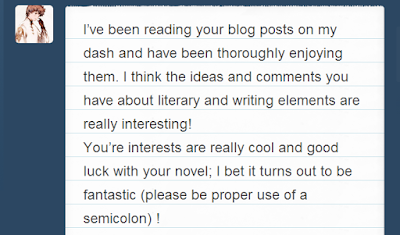 "You are a wonderful person and I am glad to have found you, your blog, and your content. Thank you for existing and helping others with your videos and articles." "I just spent over an hour reading your advice!" "I am eternally thankful for your last post '5 Common Mistakes with Dialogue.' English being my second language and mostly self-taught, I have never had the chance for anyone to tell me those punctuation guidelines/rules. . . . Bless you!" 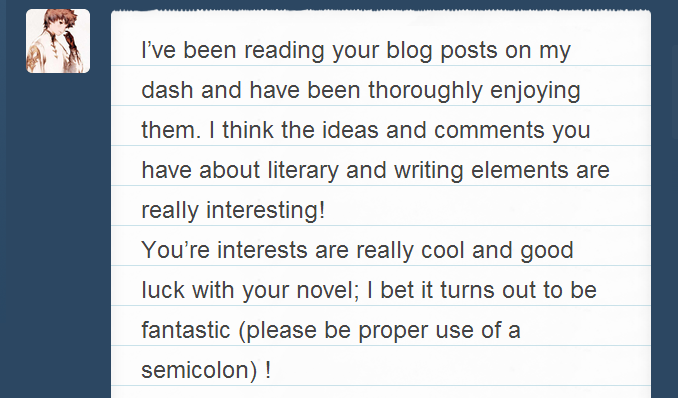 "You are by far my favourite writing blog. I love how much you care and how in depth you go. Ahh, I love you!" "Fawkes has worked as my assistant now for several years. I love working with her for a number of reasons: she's self-motivated, insightful, and is willing to tackle any job that I ask of her. More and more, I've had her editing work for me--looking over novels and writing assignments and offering critiques. Very often, the authors that we work with tell me, 'Thank Fawkes for all of her valuable suggestions. I was just simply blown away by her insights and her thoroughness.' And they're right. She is a fine editor. That's why I ask her to look over just about everything that I send out for publication." —David Farland, New York Times best-selling, award-winning author; editor; and greenlight analyst. "September C. Fawkes edited my first book in a paranormal romance series. 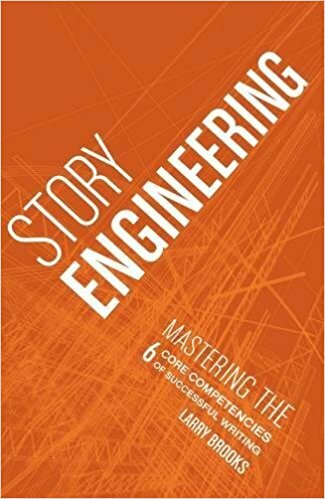 She took the time to understand my unique voice in order to find ways to enhance it, find weaknesses and give examples of strengthening them, and bring the story to a release-ready state. The changes she made were so spot on that I knew she really cared about the story and wanted it to be the best it possibly could be. The book became a bestseller and has garnered a large newsletter/mailing list for my other books." "Her editing is precise and insightful. She gets to the heart of the story and makes suggestions to tighten and sharpen the prose until it isn't just alive, but thriving. Fawkes encourages you to be the best author you can be." —Jake Marley, Grand Prize Winner of Writers of the Future, the largest short story competition in the world. "I found her comments on my MS thoughtful, detailed, precise, and kind. She is a critiquer after my own heart. I thought she did a very good job. One of the things she mentioned caught my eye particularly--where I gave a description of the MC's emotional reaction expressed physically and she highlighted it as a potential POV break because the description could easily be viewed as something that is much more like what a person looking at my character would see rather than what my character would be aware of himself, being behind his own eyes and all. It was a comment that shows me that she is really paying attention, and has a fine understanding of POV." "As a student of David Farland's tutelage, I've received explicit editorial comments from September C. Fawkes. I distinctly remember the first time her suggestions popped up in the margins of my manuscript. It's a fond memory. Not because they were glowing praises of my prose, to the contrary, she'd shown a spotlight on a number of my writing flaws. I enjoyed her edits because they were accurate and succinct. Most importantly to a fragile ego like my own, they were tactful and expressed in a fun and witty voice. It made swallowing them not the chocking hazard of previous forays into voluntary and professional editing alike. Fawkes employs a high command of the literary skills necessary to tell a compelling story and the empathy to guide authors through the turbulent waters of their own creation." "I am so thankful for the editing work that Fawkes did on my first novel, The Feather and the Moon Well. Not only did I receive great edits, but she also offered terrific suggestions to improve my story. Working with Fawkes also taught me ways to improve my writing that I will forever carry with me. I would eagerly recommend her for any writing venture." "After serving initially as a fiction editor [on The Southern Quill], she became the publication’s managing editor and oversaw the production of the 2011 edition—arguably the best in the journal’s 50-year history." "She is a Young Adult writer to watch. Her works are witty, fresh, and skillfully crafted. Her ability to draw readers in with her intriguing plotlines and life-like characters is a talent held by few others and, as such, she is sure to be a future best selling author." "As an instructor, and a professional creative writer myself, I immediately recognized talent and great potential in her work…. [it] shows a thoughtfulness concerning image and scene that is refreshing and beautiful. Her excellent knack for depiction and description immediately raised the bar for other[s]. While many writers may be able to effectively use such descriptive techniques, only the very best can do so while also masterfully utilizing sound device and literary technique. Her ability in all of these areas marks her work as more than simply entertaining writing; but further suggests her literary potential." "September C. Fawkes is the most gifted young writer I have encountered in some time. Her prose and style are exquisite; her storylines, enticing; her character development, second to none. She possesses, in full, the most valued resource of any successful writer: a burning passion for the craft. As she continues to hone her considerable skills, she will undoubtedly make a name for herself in the world of fiction." "From the first paragraph, the short story 'Shadows,' . . . grips the reader’s hand tightly and pulls them into a world of terrifying, otherworldly creatures set against the innocence of childhood. Fawkes’s ability to weave enthralling fantasy tales and create instant emotional connections between her readers and her characters shows up once again in this amazing tale of a little girl just trying to get home safely. Every story Fawkes writes creates a world so different from reality yet so real that it leaves an indelible mark on the reader’s imagination. The monster haunted world of . . . 'Shadows' has definitely left its mark on me." "I've always been impressed with September's writing. She has the most vivid descriptions and chooses great metaphors to help the reader paint a good picture of her character's setting. Her dialogue is engaging and the tension makes readers care for the characters. Most of all, I love September's wit and humor throughout her writing." "Over the last 14 years, I have worked with thousands of students in the college classroom. Few have left as strong—and favorable—an impression on me. 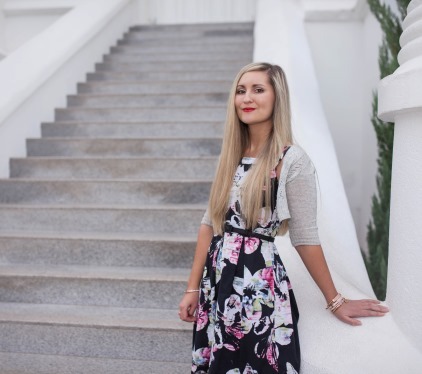 "Altogether, I had her as a student in ten classes at Dixie State College. From the start, she distinguished herself, enlivening class discussions and workshops with her insightful observations about her peers’ work. She produced a pair of outstanding short stories for the course, as well, one of which was eventually published. I watched her excel in other writing courses, as well, turning out marvelous works of fiction and nonfiction alike.